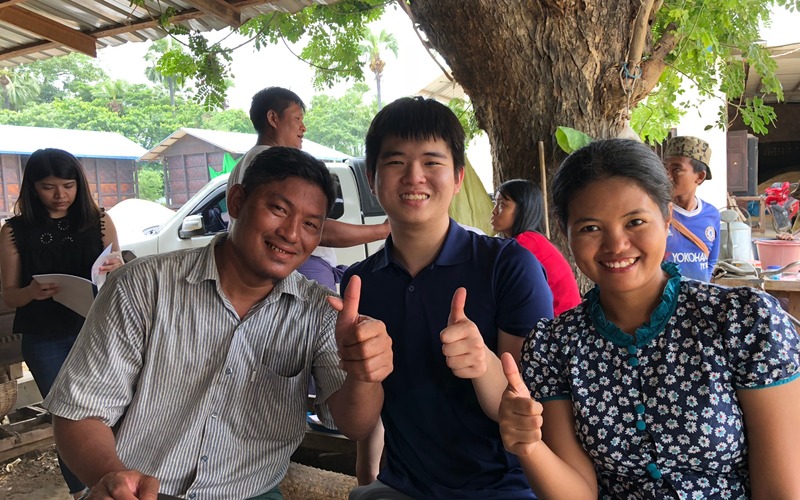 Rice Inc, the UCL-backed Hult Prize-winning social enterprise, which aims to alleviate food poverty in South East Asia, is planning to sell rice commercially after delivering on its vision to install rice drying facilities in remote villages – helping boost yields by 30-40%. In 2018, four UCL students were awarded the prestigious Hult Prize with $1million seed capital funding, for their novel idea to increase the yield and quality of rice harvests by providing village farmers with access to biomass powered drying technologies and a rice storage service. Their idea was supported by UCL Innovation & Enterprise. Since then Rice Inc has worked with the International Rice Research Institute (IRRI) and the Myanmar Rice Federation to set up a network of 40 smallholder farmers in Myanmar and installed their first Rice Inc hub in the village of Letpaden in the Bago Region. So far the team has dried 500 tonnes of rice. The team helps farmers dry their rice using sustainable sources - avoiding the high losses farmers would normally incur when attempting to dry the rice themselves. Pure drying: the farmer pays a fee to lease the dryer to dry their rice and they can then sell it to the open market. Dry and store: Rice Inc doesn’t charge farmers anything for drying the rice but stored rice is sold by Rice Inc on the farmers’ behalf when prices rise. The rice is sold to open market or millers and Rice Inc takes a commission of the sale. The idea for Rice Inc was originated by UCL students Kisum Chan (from Hong Kong) and Lincoln Lee (from Malaysia), studying BSc Biomedical Sciences, Julia Vannaxay (from Laos), studying BSc Statistics and Management for Business with Vannie Koay (from Malaysia), studying BSc Economics, joining upon further development They are all about to complete their third year at UCL and graduate. Co-founder Lincoln Lee said: “Storing rice is too expensive, so traditionally farmers either sell wet rice for a lower price or leave rice outside to dry, which could take considerable time and damage the crop. Rice Inc currently has one drying facility but is in discussions to install a further 10. Rice Inc has is completing its second rice harvest and the social enterprise is now planning to sell their harvested rice commercially. “We now aim to develop the world’s first social impact rice brand and believe there is an opportunity to sell the farmers’ high quality crop commercially to retailers and wholesalers around the world,” Lincoln added. UCL President and Provost, Professor Michael Arthur, said: “Winning the Hult Prize was an incredible achievement, and the progress they have made since has completely justified the award. “Within just six months they have developed a scalable social enterprise, which had sustainable energy at it heart, and is already positively affecting both rice production and the income opportunities of rural farmers in South East Asia. The Hult Prize is the world’s largest platform and accelerator for the creation and launch of sustainable and impact-centred startups emerging from universities all over the globe. It’s co-hosted by President Bill Clinton, the United Nations and HULT International Business School. In 2018, along with five other teams, the UCL team won the chance to pitch at the global finals having beaten 200,000 other ideas that competed at on-campus, regional and semi-final stages over the course of the year-long Hult Prize programme. The teams were challenged to build a sustainable, scalable social enterprise that harnesses the power of energy to transform the lives of 10 million people. The Hult Prize judging panel included industry leaders such as Arianna Huffington (co-founder of Huffington Post), Paul Polman (Global CEO, Unilever) and Hans Vestberg (CEO, Verizon). The panel saw the potential in the UCL team’s idea and they became the first team of South East Asian students to win the annual prize. Talking about the inspiration behind the social enterprise concept, Lincoln Lee, said: “Our team is made up of Malaysian, Laotian and Hong Kong nationals - countries where rice is the staple diet. Everyone eats it every day, it is part of our culture and our society would collapse without it. “When we looked at the rice supply chain across South East Asia, we were shocked at how inefficient and wasteful it is. And the very people growing it are the ones left behind by the industry and society.